It was very hot, but it rained a little and cooled things off. I performed on the rolla-bolla from 6 p.m. until after 9 p.m.
People seemed to like it. I have some gloves and balls that light up in the dark, and that looked really cool after dark. 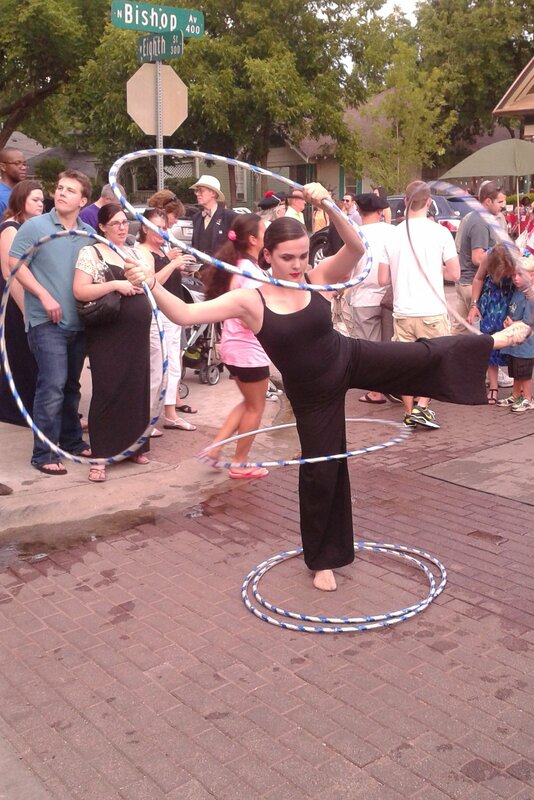 I spun plates, juggled balls and silks, and used my hula hoops, too. The biggest hit, though, was my newest trick: I wear a blindfold, and juggle without being able to see. My picture was taken for a lot of local newspapers and stuff. It seemed like everybody who walked by pointed a camera at me! Grandma said we weren’t supposed to put down a hat for tips, so I didn’t. But people kept trying to put money in my pocket while I was on the rolla-bolla. Grandma got scared that someone was going to push me off. So she let me put down my hat about halfway through the evening, and I wound up getting over $50 in tips. Bet I’d have made more if she’d let me put it down sooner! Jessie Patterson is one of my favorite Lone Star Circus performers to watch, and she’s very nice too. 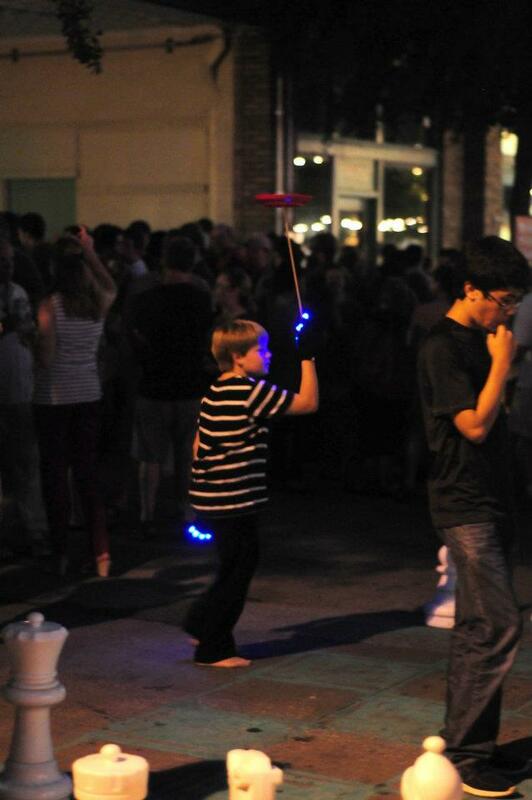 She was across the street from me at Bastille Day, so I got to watch her while I juggled. She is awesome. 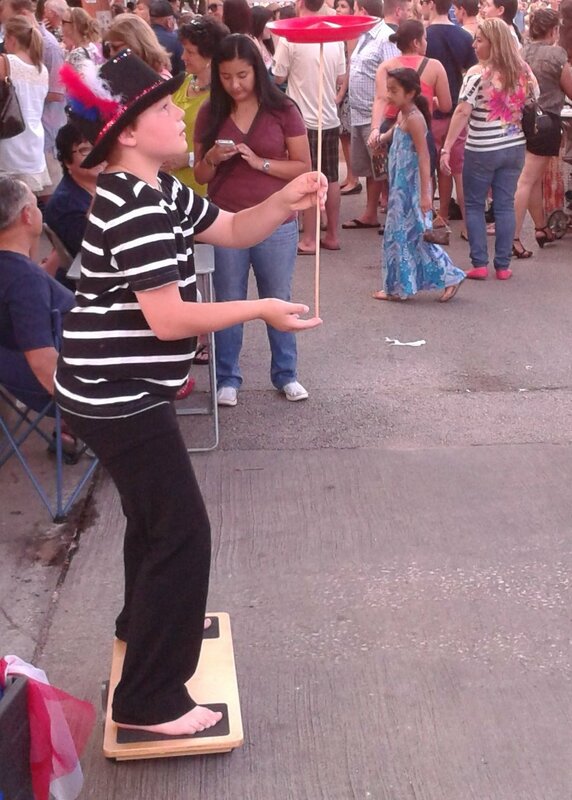 One of the fun things at the festival — besides the snow cones, which were awesome — was that a lot of kids stopped and we emptied my whole juggling crate and pretty soon I had about a dozen kids learning to juggle with me. That was cool! But the coolest thing is that this juggler named Tommy, who teaches at one of the high schools in Oak Cliff, gave me a unicycle. A really nice red one, too. I was just standing there on my rolla-bolla juggling and he came up and started talking to me. He asked me what I wanted to learn next, and I said I wanted to learn to juggle on a unicycle. So he went home and got one and brought it back to me. He said it’s too small for him. I’m going to learn to ride it, and next year, I’ll be riding that unicycle all over the festival, juggling all the way!